The Burning Legion are one of my all time favourite villains. They quite literally have it all, style, pithy one liners to be quoted in guildchat ad nauseam and unshirking commitment to their goals. So, in the build up to Legion and in at attempt to get back into blogging for more than a week every six months, I’m going to be celebrating all things demonic. Is the speed and ease of leveling in the eye of the beholder? Personally I think speed and difficulty or rather the lack of it are two separate issues. There are a plethora of ways in which we can boost our experience gain per hour, from seasonal buffs to the Darkmoon Faire Carousel ride and the Monk daily. That’s before we even factor in the bonuses questers get from being guilded or from wearing heirlooms. Not that only, the options for the discerning leveler have never been more varied. You can pick herbs, mine, pet battle, quest, dungeon, battleground, dig artifacts out of the ground or mix and match your way to 90. Yes, things are exceedingly fast these days. I think my recent Monk managed about 45 quests to go from 80 to 85 with a few flower picking sessions plus a bunch of battlegrounds thrown in. That’s about 10 per zone. However I don’t see this an issue because even ignoring the fact that I could have stripped off my heirlooms and not bothered buffing up with experience buffs, if I really wanted, there is nothing to stop me doing the same content I would have done whilst leveling at 90. In fact I will still pvp, quest and pick herbs on my Monk when she levels. It’s just that former should get a bit harder, the middle bit easier and the latter remain the same. Dps might be a tad too high, especially when kitted out in decent gear. As a Mistweaver I probably shouldn’t be kicking monkeys in the face for 70k (half their health). Which brings me onto the bigger issue in my opinion. Difficulty or the lack thereof. The hardest part of AoE grinding is finding enough mobs to pull at once. Dungeons can be two manned and can often be completed without a tank, especially at low levels like Wailing Caverns. Most of the complex dungeons have been neutered, not to mention shortened. 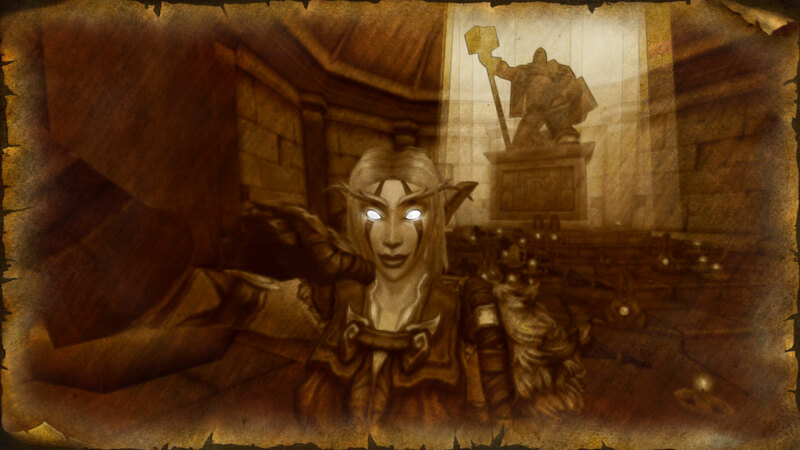 My first Blackrock Depths run took five hours and by that point we still hadn’t found the bar. Now whilst I admit this might not have been awesome game decision but it did help you get ready for raiding, even if it was just getting used to the idea of spending five hours in the same place whilst the people around you argued about tactics. Even with my predisposition for wandering around taking screenshots and not paying attention, there aren’t any real nasties lurking in the undergrowth, no more Stitches patrolling the road or the Crimson Courier riding about looking to make mincemeat out of non-believers. Perhaps I’m looking at the game wrong but I’ve always believed that as you level not only do you learn to play your class correctly but you also figure out new aspects of the game as and when you encounter them. For example I’m far more understanding of a tank who can’t tank in the Deadmines than I would be in a LFR situation. Equally I’m fine explaining how a particular battleground works and that I can’t hand in their flag until our team wakes up and returns ours in a level 20 to 25 WSG than I would be at end-game. Making things too easy has a dangerous flip side, especially when it comes to certain toxic elements in the community. Convenience is a wonderful thing but so much was learnt through necessity previously (including the whole avoid the roads in certain zones on pain of death and don’t touch the Blood of Heroes). I learnt to kite on my Hunter between levels 1 and 10 when I was pet-less and you either had to slowly melee things to death or figure out how to jump kite. I can’t help thinking that a few simple changes would help. For example we now have mobs whose health pool increases depending on how many people are in combat with them. How about taking that and increasing quest mobs in relation to the item level/health of the person engaging them as well as party size. The AI especially for named mobs should be more exotic too. We have kicks, slows and cc for a reason. Things would be far more fun and challenging if just like the Monk quests, we actually had to use them whilst leveling. Or alternatively if all classes had access to dailies like the Monk ones which require you to use certain abilities because no one should get to end-game without understanding all their spells. Dungeons really shouldn’t be doable with two, especially if neither of those are tanks and “elite” mobs should make you think twice about charging in at half health. Of course making the game harder would also have the knock on effect of making leveling take longer too so it could be a bit of a win win situation for some people. Although whilst many people see leveling as a means to end rather than a game within itself, I suspect that we’re going to see the levels before end-game get easier and easier and quicker and quicker.